The capital of Hungary, Budapest is like two towns in one, with the Buda district on one side and Pest on the other. This incredible city offers so much for the traveller, from good food and drinks to stunning architecture and history. Budapest is just a quick, 2 hour 20 minute train ride from Vienna. We traveled with OEBB and were very impressed at the comfort and free wifi. 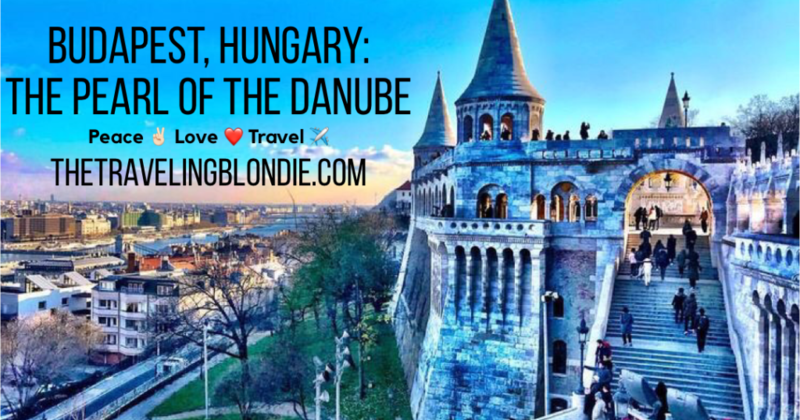 Check Out My Blog Posts If You’re Venturing To Nearby Vienna, Austria or Prague, Czech Republic! Spring, Summer and Fall are the high seasons for tourism, but the winter has its own special charm. There is an abundance of Christmas Markets strewn throughout the city, making it so incredibly festive, there’s like a whole new energy to the city, despite the cold! This was one of the most beautiful and spacious Airbnb’s we’ve ever stayed in, not to mention that Bernie was one of the most incredibly kind and helpful hosts we’ve had thus far (and I think we’ve stayed in 40+ Airbnb’s). This place is clean, modern and centrally located. Put that together with a super accommodating host and you’ve got the BEST recipe for an unforgettable trip! SUBWAY: Because we were so centrally located and we LOVE walking, we didn’t take the subway at all during our visit, although I’m told that it’s a great mode of transport that is clean, fast and safe. WALKING: As always, you can get some exercise in and save some cash by walking. TAXI: We hopped in a taxi a few times and had no trouble at all. Just note that you make SURE THE METER IS ON and you’re able to visually see it, as it is known that taxi drivers have scammed tourists before. 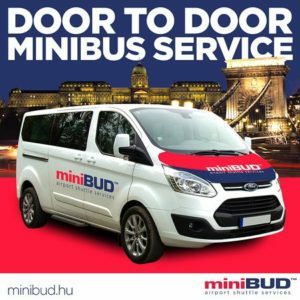 Minibud was the BEST airport transport service we’ve ever had in all our travels! For 5,900HUF ($22USD), their airport shuttle bus will pick you up at your hotel/Airbnb and take you to your terminal. Booking was seamless and so was the ride. Hungarikum Bistro is THE place to eat in Budapest, so much so that they usually have no availability for months ahead of time. Luckily, we snuck in due to a cancellation. 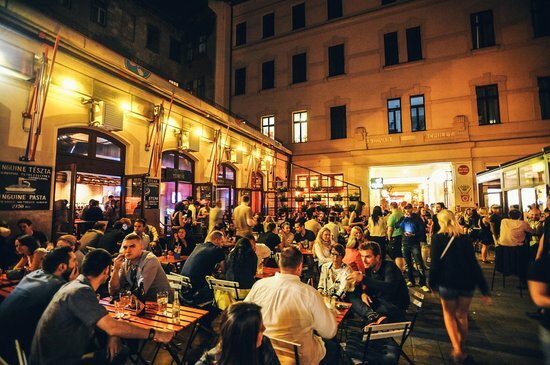 As soon as you’re thinking about going to Budapest MAKE A RESERVATION! The food here is traditional Hungarian, with local wine and outstanding service. There’s also a pianist playing live music during your dinner. It’s absolutely perfect. Be sure to get the Crispy Duck Leg, it’s mouthwateringly delicious. 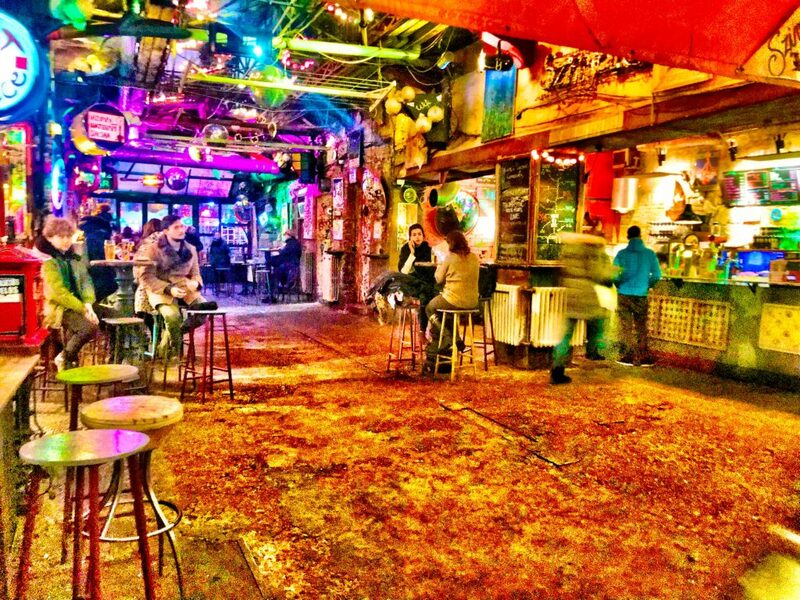 Ask anyone where to drink at in Budapest and ruin bars will surely be the most people thing mentioned, especially Szimpla Kert. Ruin Pubs are found all throughout old District VII in the ruins of abandoned buildings and stores. It’s a one of a kind experience to just stop in a have a look around, even if you don’t drink. 7 different buildings in the Jewish quarter that is packed with restaurants, pubs, cafes and bars. Ruszwurm Confectionery is located at Fisherman’s Bastion and a stones throw from Matthias Church, this cute little family run confectionery is a perfect spot to stop and have coffee and homemade pastry cake, if you can get a table! A deep fried doughy flat bread topped with chicken, potatoes, cheese…anything! If you eat only one thing while visiting this great city, then this must be it! They are quite large and perfect for sharing with 2-4 people. 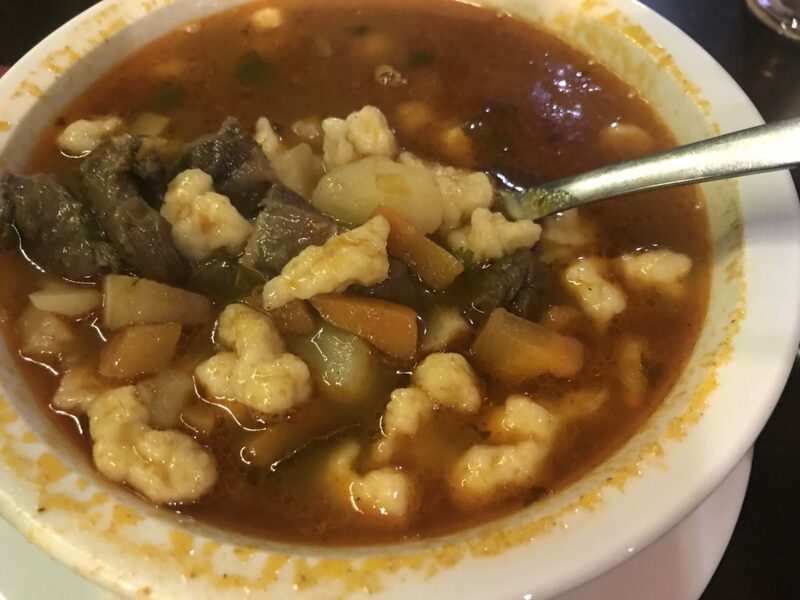 A warm, hearty beefy soup dish with potatoes and veggies native to the region. The BEST winter treat around! 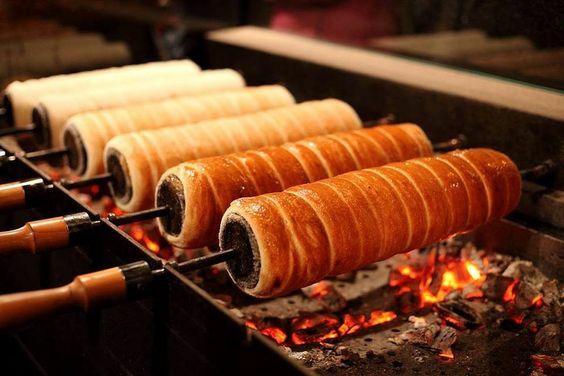 Although we loved the chimney cakes in Prague more, the chimney cakes here were also super yummy! If you’re looking to enter all the top sights, attractions and public transport in the city and would like to save some cash, then grab the Budapest Card prior to your arrival! First, you’ll select which card type works best for how long you’ll be visiting. Then you’ll head to a Budapestinfo Point Location at the airport or city center to redeem your card. Fill out the ‘Valid from’ portion of the card, sight the card and you’re good to go! Cost Ranges from 17-33 Euros for 24-72 hour passes (20-40USD). You cannot miss this beautiful bridge when you come! 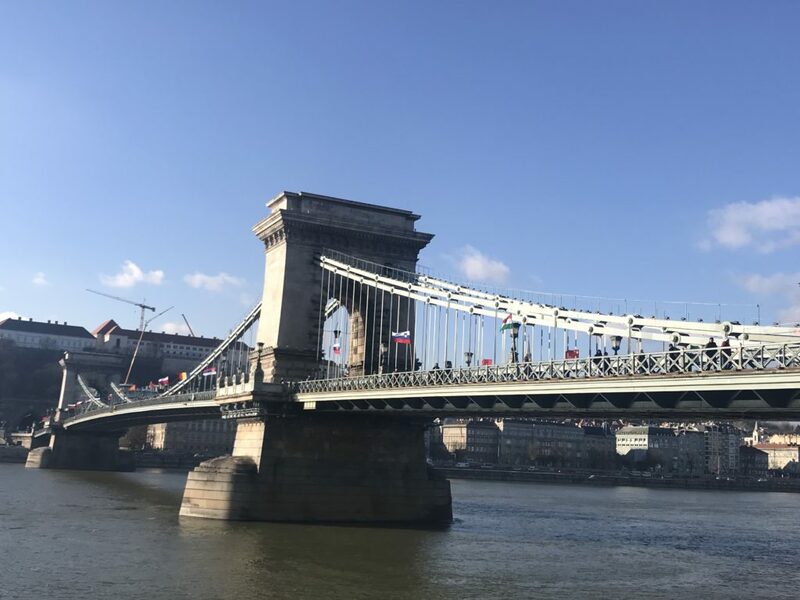 One of the best known landmarks in the city, the Szechenyi Chain Bridge (opened in 1849) spans the famous Danube River and connects the Buda district to the Pest district. 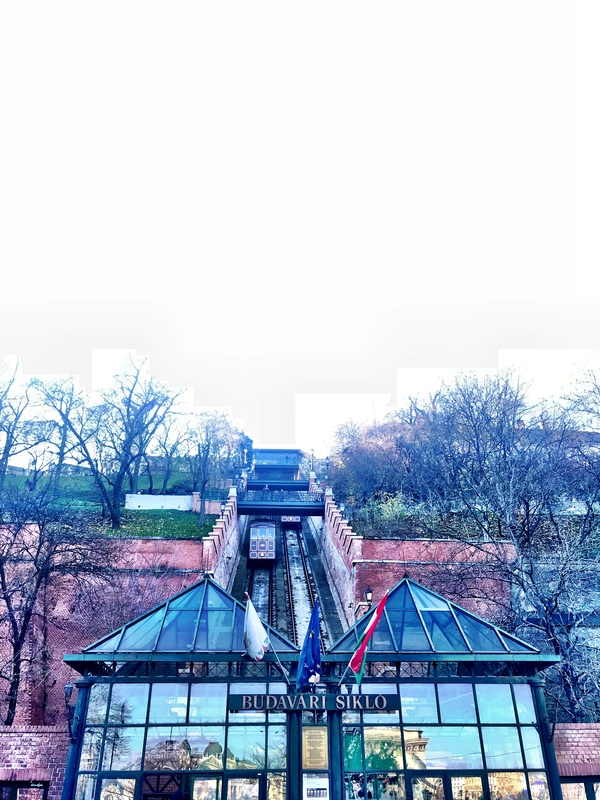 The Buda Castle Funicular is a short railway car that is a fun and easy way to get to the migrate to the top of Buda Castle, especially if walking up a giant hill isn’t you’re forte. We opted out of the Funicular and chose to save the cash and tackle it on foot. Cost for a return ticket is 1800HUF ($6.85USD), but you can always take the funicular up the hill and walk back down. This iconic castle is absolutely massive! 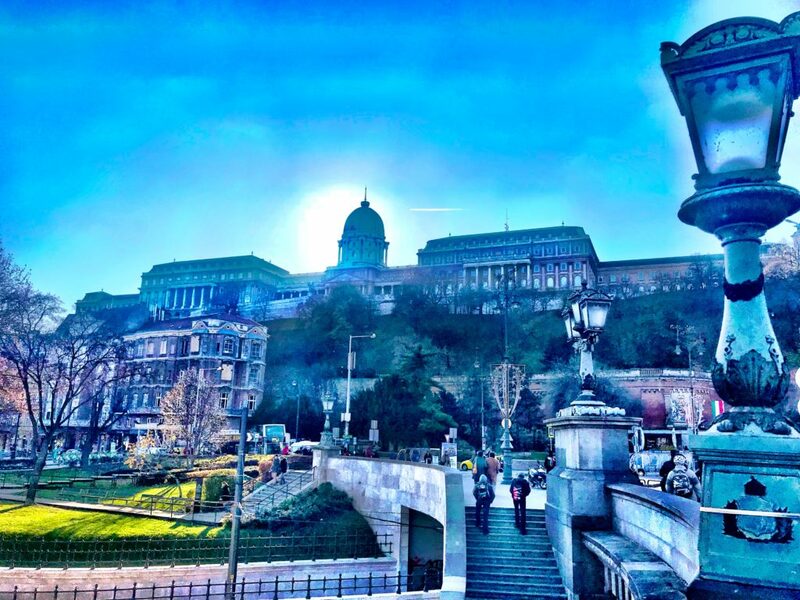 Buda Castle is the massive castle of Budapest, located on the Buda side of the Danube River. It’s also the palace where the Hungarian kings reside and home to the National Gallery and Budapest History Museum. One could spend a whole day or even a week here! Cost per entry is between 1800-2000HUF ($6.85/$7.61USD), depending on the season. The price includes both the National Gallery and History Museum. 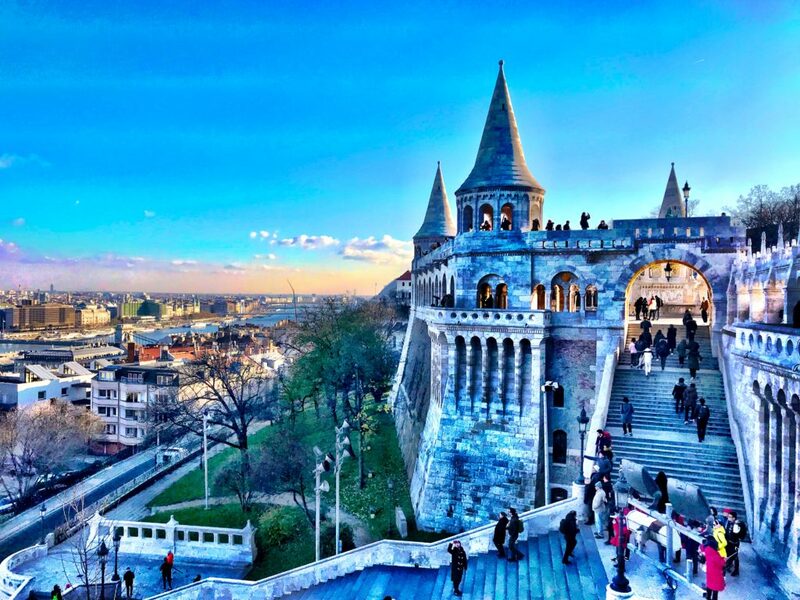 The BEST Site To See In All Of Budapest, Hungary: Fisherman’s Bastion! 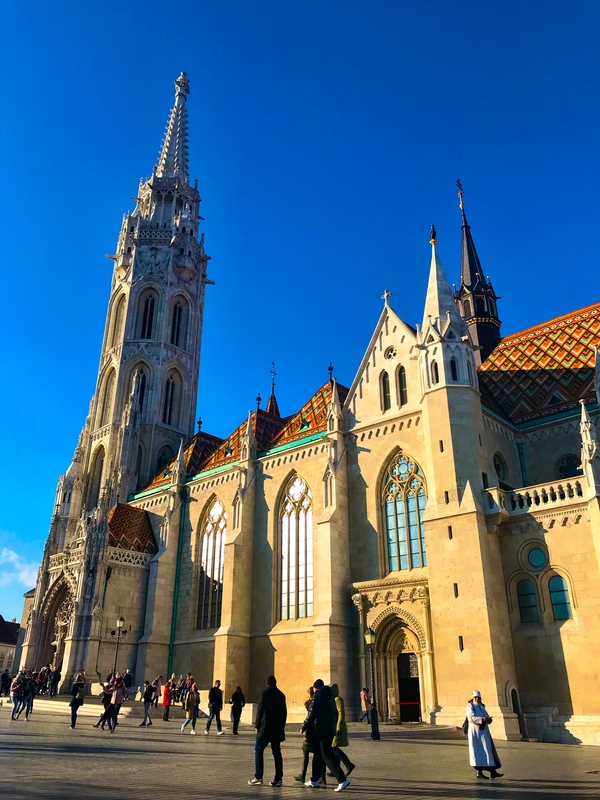 Located in Fisherman’s Bastion, Matthias church is one of the first churches (opening in 1015) ever in Budapest and it is absolutely unforgettable. The mosaic on the roof will have you staring for hours. I was truly memorized by the church itself and its surrounding Fisherman’s Bastion. Cost for entry is 1500HUF ($5.70USD). 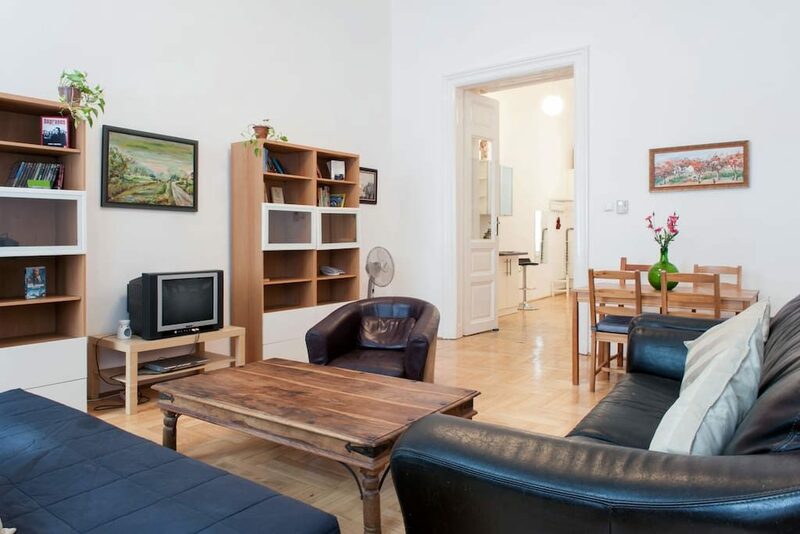 For a true historial experience in Budapest, head over the Jewish District. The narrow streets are full of charm with lots of shops and restaurants. 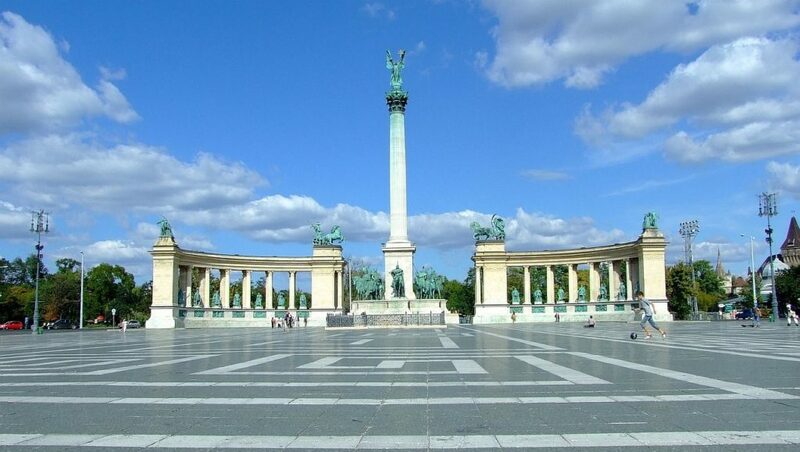 Be sure to take a stroll through City Park and Heroes Square on your visit: a historical square which features the Seven Chieftains of the Magyars as well as the Tomb of the Unknown Soldier. City Park is a great place to run or have an afternoon picnic in the summer months. 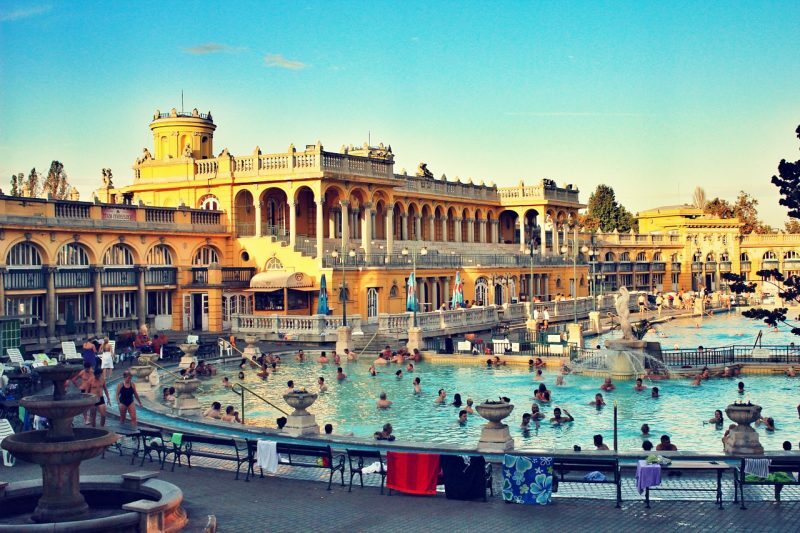 Thermal baths are all the rage in Budapest and Szechenyi Baths is absolutely the most popular. 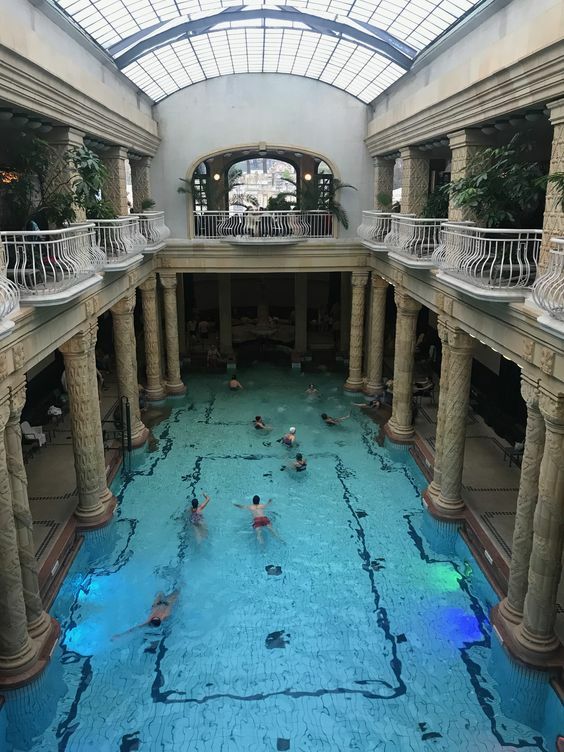 We decided to check out Gellert Baths instead, but Szechenyi is definitely worth stopping at after visiting Hero’s Square, especially in the cold, winter months. Cost for entry is 18 Euro (21.60USD). Gellert Spa was so kind to host us as guests for the day and, if you’re into public hot springs, then I’d highly recommend them! They have many different baths ranging in various temperatures from cold to hot. Be sure to bring flip flops and your own towels, or you’ll have to pay to rent theirs (and many get stolen). They even have a cafe upstairs, if you work up an appetite swimming around the pools! Cost for entry is 20 Euros (24USD). An absolutely gorgeous structure from the outside, the Opera House is worth taking a stroll by to grab a photo and admire, even if you don’t enter inside. 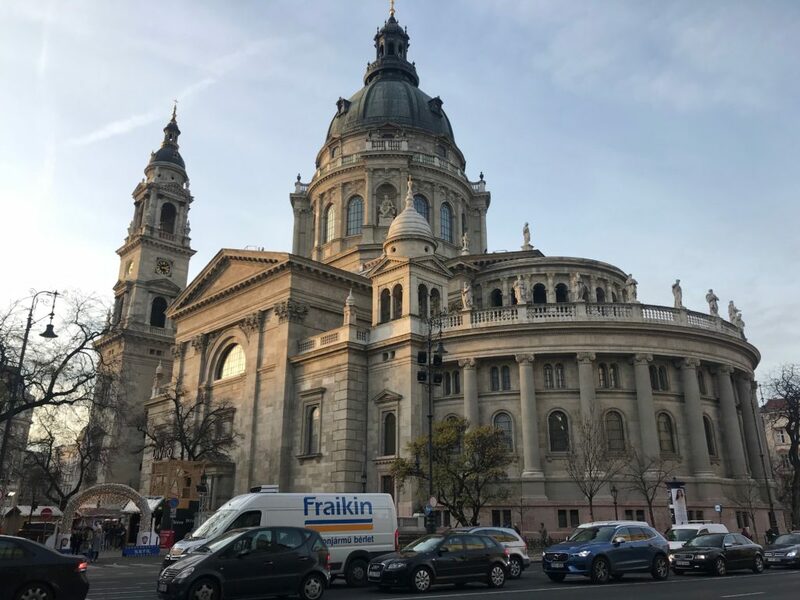 St. Stephen’s Basilica is a beautiful, historical Roman Catholic Church of the city. Cost for entry is free and guided tours are available M-F from 10am-3pm for HUF 2,000 (7.72USD). 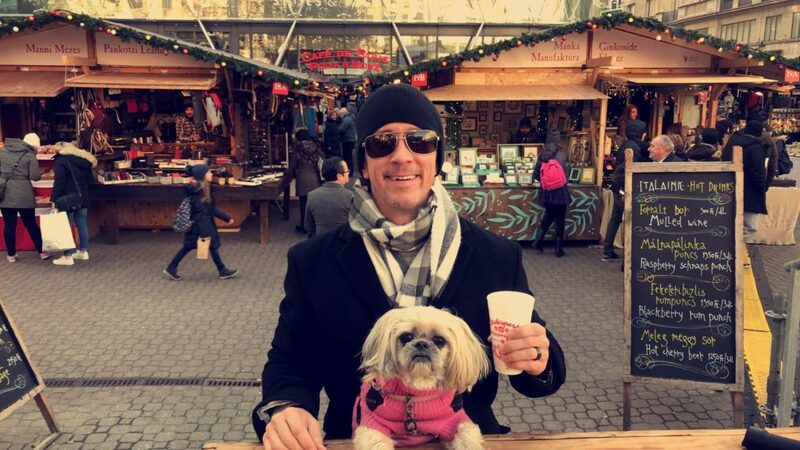 The Christmas Market at Vorosmarty Square was magical! 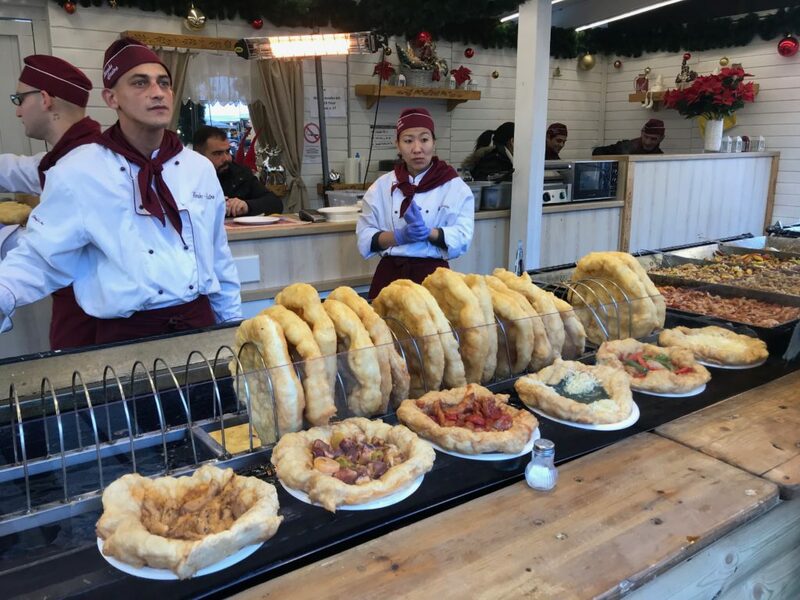 If you’re lucky enough to be visiting the city during the Christmas months, then head to Vorosmarty Square for a lovely Christmas Market filled with delicious food, treats and homemade crafts. For more retail fixes, take a stroll up Vaci Street afterward. NR1Fitness is an AWESOME gym that is quiet, clean and has great equipment. It’s also open 24 hours. Simply sign up and pay online and you’ll be given a code to enter on the keypad outside the door of the gym. One entry will cost about 2,000HUF (7.72USD). Great stuff. Very useful as a first time traveller. What souveniers did you get in Hungary? Thanks so much for reading! Because we were traveling Europe for a year with just a suitcase, we sadly didn’t purchase any souvenirs. We collect local currency and make a Youtube Video from each place we go, which worked for us! There are an endless amount of souvenirs to choose from in the city. 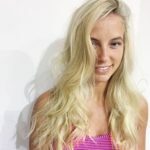 Hope you have a great trip!